As a corporate financial you probably have heard from (or worked with) the tools Hyperion/HFM or FDM. The two great minds behind these tools were Bob Powers and Tom Shea who (after their companies had been acquired by Oracle) went back to their garage to start a new project. A project with the intention to change the world of Corporate Finance again. This project turnout to be the EPM platform we now know as OneStream XF. "It’s a next generation EPM platform that has the potential to transform organizations"
OneStream XF is already working with major companies like Guardian and Federal Mogul and Dutch organizations like Takeaway.com, TMF Group and Eurofiber. For OneStream being a relatively young company it is quite remarkable that Gartner has already named them Visionary. But what is OneStream exactly and what’s this vision that gets their name listed in the Magic Quadrant? Its one Platform for Consolidation, Planning and Reporting that eliminates all the issues you encounter using software "suites" and has the potential to transform organizations. It’s also the technology that our consultants love to work with. What is OneStream, and why is it so visionary? Before we dive into the specifics lets look at the vision of Onestream and how Gartner describes the Platform. OneStream delivers a thought-leading cloud platform for financial consolidation, reporting, planning and analytics for the dynamic enterprise with unified solutions with an easier and more cost effective approach to ownership. This cloud platform can extend itself with a complete set of domain specific MarketPlace solutions that allow customers to begin solving business problems on day one and eliminate the technical baggage of more software to integrate. OneStream has been able to capture the mindshare of enterprise level customers by adhering to their mission statement to deliver 100% customer success and reference ability. Our vision is a world where corporate and business units no longer need to compromise between one polluted application and multiple product and application deployments. We deliver complete CPM solutions without compromises. This allows finance teams to quickly and easily adapt to new regulatory, compliance and risk management requirements while becoming a true business partner to the executive management team. To let you fully understand these statements we will walk you through the most important parts of the platform regarding these statements and share with you our thoughts on Gartner’s report. There are many tools out there that claim to be a unified platform but simply are not. To understand the difference you need to know what makes a unified platform a TRULY unified platform and not a “suite”. The majority of suites consist of “modules” for things like consolidations, planning or reporting and were added to the suite by acquiring the company that developed the original tool. These tools were all build with different technologies but still needed to be able to communicate with each other within the suite. Therefore, upgrading a suite is a very time expensive exercise and thus it costs a lot of money because all of the “spaghetti” of communication lines and integrations need to be upgraded in order to work. This results in extensive reconciliation efforts and often frustration and extra cost requirements for hiring consultants when upgrading the suite to a newer version. Local reporting users may be spared the complexity of these integrations and reconciliations – but at the group level this often results in the unnecessary delay of financial processes, pollution of data quality and significant time and financial cost to the organization. OneStream XF is the only true unified platform for Corporate Performance Management at the moment with a proven track record to assist with the elimination of issues inherent with a suite solution. Using OneStream is like using a smartphone where you just download a specific app (like IFRS16 reporting) and start using it without needing to integrate solutions. "Possibly the biggest game changer, is something called Extensible Dimensionality™"
Consolidation, planning and reporting (and ETL...) in one! Indeed, most EPM software vendors deliver a solution for both consolidation, planning and forecasting. However, they do this by using multiple products which are bundled into a suite. With OneStream, this is all truly integrated into one platform – and this why Gartner recognizes this as a strength. Gartner didn’t mention ETL in this first statement of strengths. But we believe that it should have been included also, because this is another true differentiator as extracting, transforming and loading data (“ETL”) is also an integral part of the platform. We often talk to customers stating that their existing EPM tool is also unified. However, once they look at OneStream, they have to admit that this was not truly the case. OneStream is one of the most powerful consolidation tools available. Financial consolidation and reporting is core to OneStream’s platform. Delivering timely and accurate financial consolidation and reporting that meets corporate external- and management reporting requirements while also providing business unit operational relevance. OneStream eliminates the chaos of seeding, collecting, revising and approving data by offering guided and controlled (workflow-) processes with the flexibility to adapt as your business changes. Additionally, the growing number of OneStream customers, also use the same platform for driver based planning, budgeting and forecasting, while re-using (meta-) data from their consolidated actuals. Possibly the biggest game changer, is something called Extensible Dimensionality™ – which is unique to OneStream. This enables users to have different granularity levels across all dimensions. This means for example that there can be a different level of detail in the budget process compared to the monthly reporting of actuals – or vice versa – without feeling the pain of reconciliation and transferring data from one application to another. An easy way to understand this, is a comparison with mobile phones. Back in the days people used to work with standalone software (the Nokia) that didn’t connect to any other tools. Not long after “suites” were introduced making it easier to integrate different tools thus letting departments work together more efficiently." 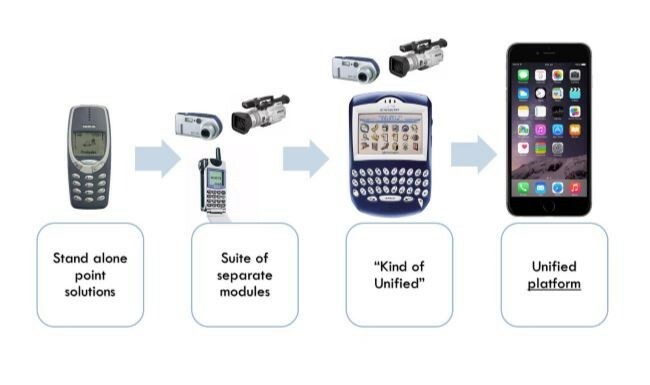 The next step was the first approach to a (kind of) Unified Platform (Blackberry). The “platform” still needed integrations with other tools to fully support users and for new functionality to be added developers had to work many hours to develop additional functionality. And now we have arrived at the smartphone which is OneStream. OneStream is a true unified platform like a smartphone. Compared to OneStream all other status quo tools are the Blackberry or less. The OneStream platform can be extended by its users, through the Marketplace which can be best compared to the Apple app- or Google Play store. It is supplying users with new functionality without the need of consultants or developers. The OneStream XF marketplace offers users a variety of apps like capex-, people-, cash planning and account reconciliations – to name a few. Just download (for free), configure and start using it. It’s truly revolutionary in the field of EPM. And it is precisely as Gartner states: you don’t need extra software for solving these business problems: you simply download an app from the Marketplace onto the OneStream platform. The apps re-use the existing (meta-) data, so no integration of separate tools or software. We believe that this is the most important reason of OneStream’s success. It is not just a sales pitch. The entire organization is built upon the belief that “customer success and reference ability is the only option” – as OneStream reports in their mission statement. And in our experience, this is true. The responsiveness of their support organization is experienced by end-users (and us also!) as fast, friendly and knowledgeable. Also, OneStream pro-actively shares a list of all their customers to any prospect, for them to contact and check references. And we explicitly say “all”, not a convenient few. Are you currently working with legacy EPM systems? OneStream is truly changing corporate finance. They provide an alternative to the user-unfriendly (and to expensive) EPM “suites”. OneStream will save companies large amounts of money but more important it will help teams perform at their utmost potential enabling them to supply CFO’s with groundbreaking insights at a speed which the competition can never keep up with. Already familiar with OneStream XF? Read our update about the 4.2.0 release here. If you are curious how companies like Guardian, Premium Sound Solutions and Takeaway.com are harnessing the power of OneStream? schedule a meeting to discuss your road map to next generation EPM! INFOGRAPHIC Suites vs Unified Platforms | What are the differences?